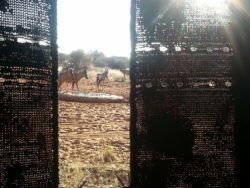 A Professional Hunter in Africa – What’s That Gig Like? 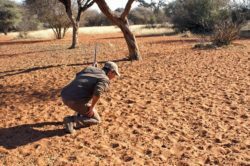 PH “Koos” DeWet checking a blood trail while tracking a warthog in South Africa in 2014. Professional Hunter, a title some hunters assume due to their hunting prowess and success. But, it’s an earned title in Africa. 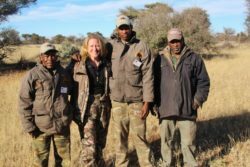 On my recent 10-day hunt in South Africa, I meet some wonderful professional hunters – or “PH” as they’re called. A PH is required to accompany every foreign hunter there. “My” PH, Jacobus Ignatius DeWet, “Koos” for short, was stuck with me for 10 full days and was gracious enough to share his background and thoughts on the job. He grew up with an ecologist father, hunting most of his life. So, when he signed up for PH school, he thought it would be easy. That assumption quickly “came crashing down to earth”. The intensive 10-day school covers animal biology, habitat, hunting and tracking; as well as laws, cooking, skinning and treating skin, trophy preparation, and wilderness first aid. It seems they cover in 10 days what a prospective biologist might cover in a few semesters at a university. To pass PH exams, students must score at least 70% – just like the test I had to take as a wildlife biologist with Minnesota Department of Natural Resources. However, tests are practical, not multiple choice. Upon surviving school, PH candidates must serve at least 60 days of hunting under an experienced PH. 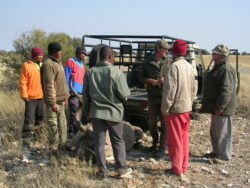 This apprenticeship often lasts a year and is done working with an outfitter or on a game farm. A separate dangerous game license – which covers elephant, rhino, lion, leopard, buffalo, and hippo – requires at least another 60-day internship, where candidates must go on 60 dangerous game hunts. I imagine it must be difficult to find someone to take you under their wings knowing they’ll be competition someday. Once experience is documented, the license applications are completed, one for each country in which you hope to work and sometimes in multiple areas within a single country. For instance, South Africa has 9 regions; 9 licenses, each ranging from $5-$30 per year. Once PHs are “locked and loaded”, they work to find outfitters to hire them. Some PHs are lucky enough to find an outfitter to fill their season with hunts. Koos’s ideal would be to hunt in different camps to experience all of Africa, but it’s risky to not settle into a camp. PHs are also at the mercy of changes to hunting laws and property. This year, Koos was supposed to spend the season in Mozambique, but the outfitter lost his concessions (outside properties used for some species), which canceled his entire season. Lucky for me, but it meant he had to fill the season with any work he could get. In most camps, PHs are required to provide a reliable, high-quality truck. A good rig with four-wheel drive and plenty of setting for clients and gear costs $60,000 or more. Tires must often be replaced at the end of each season. Some PHs employ their own trackers and skinners. Some provide a good dog, like Rigby, whose owner was a PH everybody called “Bone”. Rigby was our camp’s keen tracker, while Koos said his tracking dog was legendary. A dog is still a man’s best friend. A PH’s fee includes a daily hunting rate, plus meals, laundry service, fuel, and mileage (to cover wear and tear). That’s only half of the story. Because clients come from all parts of the world, a PH must speak multiple languages. Specifically, English is required as are Spanish, German and French. Although I don’t know, I often heard them speaking Afrikaans – the official South African language which is Dutch-based – I learned to decipher their meaning through their eyes, facial expressions, and hand gestures. I also learned that B.S. is a universal hunting language, and I dished it when I could. Finally, a good PH must read the client. I wanted a nice kudu but made it known I wasn’t demanding a monster. I just wanted something I could show to my hunting colleagues with pride. I’m sure some clients prefer quiet, peaceful hunts, and probably put lots of pressure on their PH for a particular animal. Instead, I asked a ton of questions about everything, and Koos accommodated with tons of answers. Our conversations continued from sunrise through the last drink. That makes sense, too, because much of a PH’s job relies on tips, and so a good PH figures out the atmosphere the client wants. I was on a mission to hunt and learn. Mission accomplished. If a client comes in with an open mind, the PH will become a friend. At least two hunters in our group requested the same PH from a previous hunt. When we arrived, they warmly greeted each other like old friends. I left a bit sad, realizing I probably won’t have the same chance. Thanks to all of my wildlife conservationist friends (and PHs) who made my experience so memorable at Wintershoek; Johnny Vivier, Flip Coetzee, Johan Maritz, Hannes Vlok, Stuart Pringle, Yvan Nieuwoudt, Jeremy Scheepers, LeRoux Coetzee, Arbrie Arlow, Bone DuPreez, Pedrie Van Jaarsveld, Strauss Jordaan, and of course, Koos De Wet. May God bless you and keep you safe protecting and caring for the wildlife of Africa. Additional pictures from the hunt and story can be found in ArrowTrade magazine. Check out Part 1 and Part 2 of my stories on What it Takes to be a Great Mentor. This article first appeared on August 26, 2014, at www.archerytrade.org.